Brrrrrrrr! It’s downright wintery around these parts and I, for one, couldn’t be happier. Monday it SNOWED big fat fluffy flakes. I love the cold! I love the snow, skiing, sweaters, cozy blankets, comforting foods, fires, hot mugs of tea, baking cookies…I could go on. I’m sure I’ll be singing a different tune when this weather lingers well into March and April– sometimes even May, ugh–but for now, I’m one happy camper. Whether you’re as psyched about the frigid temps as I am or wish you were tanning on a caribbean beach, I have a meal that will warm you right to the core: Slow cooker 11 bean soup. It’s vegetarian, vegan, and gluten-free. I’ve noticed there aren’t enough meatless meals around these parts. I’m going to change that for you! I have a secret behind this meal that takes very little work: Use a dried bean soup mix. I’m sure you’ve seen them before–the packages usually contain dried beans and a spice packet. Except in the recipe below, we’ll toss all of the instructions aside and use mine instead. Deal? Deal. I used this mix by Frontier Soups that I found on our honeymoon. You can buy it online. 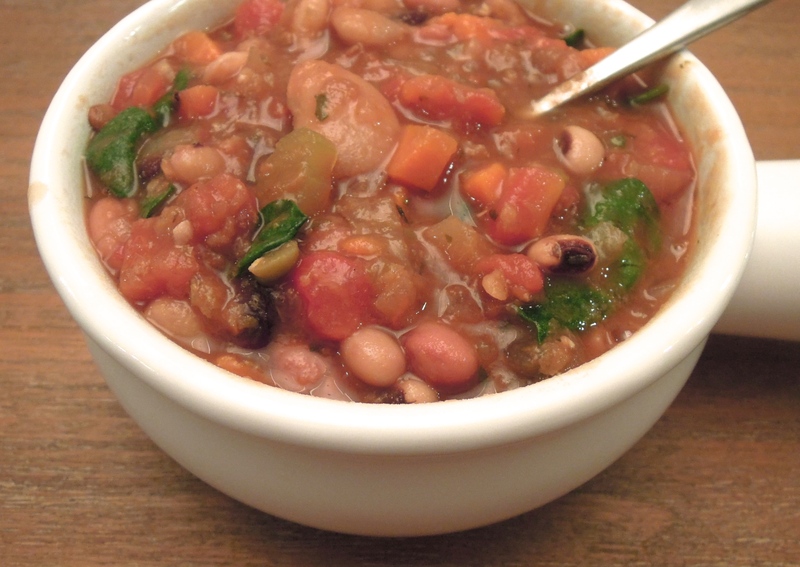 Another good option is Hearty Eleven Bean Soup from World Market. Any kind will do (and it doesn’t need to have exactly 11 kinds of beans) as long as it already includes a spice packet. Then you just chop up some veggies, dump it all into the slow cooker, and stir in some tomatoes and spinach at the end. Wrap your chilled hands around a warm bowl of this soup, cozy up to someone you love, and I promise we’ll all make it through the winter just fine. In a slow cooker, add dried bean soup mix, bouquet garni of herbs, carrots, celery, onion, tomato paste, and vegetable broth. Cook on low for 8 to 10 hours. Add tomatoes and spinach. Cook about 10-15 minutes longer until spinach is wilted. Add salt and pepper to taste. This entry was posted in Slow Cooker, Soup, Stew, Vegetables on November 13, 2013 by Paige Greenfield.